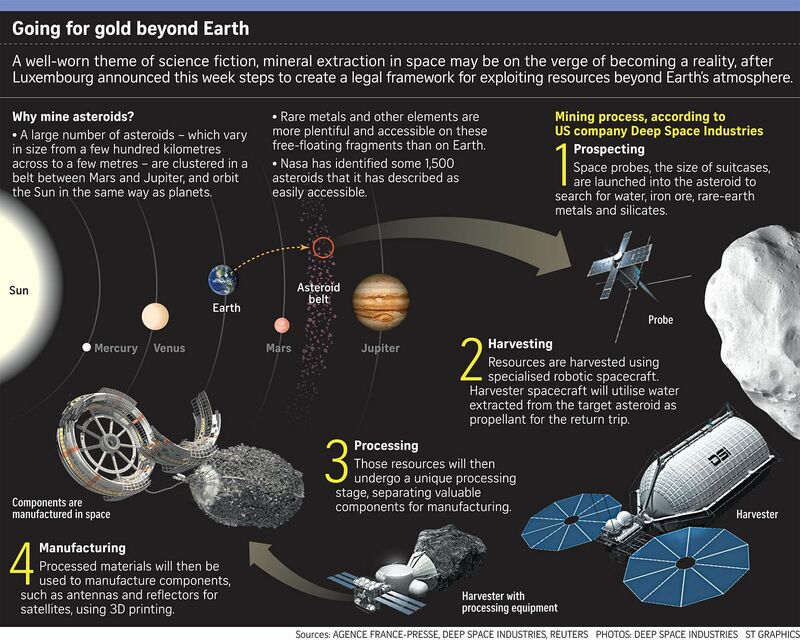 LUXEMBOURG/PARIS • Luxembourg is positioning itself to pioneer the potentially lucrative business of mining asteroids in space for precious metals such as gold, platinum and tungsten. The government announced on Wednesday steps to create a legal framework for exploiting resources beyond Earth's atmosphere, and said it welcomed private investors and other nations. The framework is expected to be completed by the end of the year. Primarily known for its fund management and private banking industry, Luxembourg would become the first country in Europe to give legal clarity to the commercial exploitation of asteroids. Such mining is at least a decade away, if not longer. But the duchy's move is expected to draw interest from pioneers in the field such as US operators Planetary Resources and Deep Space Industries. "In the long term, space resources could lead to a thriving new economy and human expansion into the solar system," said Economy Minister Etienne Schneider. Last November, the United States passed a similar law which cleared American companies to own what they mine from asteroids and other celestial bodies. Extracting resources from celestial bodies is a volatile and contentious issue, with global treaties calling for exploration to be carried out for the benefit of all countries. But advocates say mining in space would not only help to provide diminishing resources for Earth, but also aid in the exploration of distant planets. "Exploring space requires use of space resources, because you have to bring every kilo of water, fuel and food from Earth, you will not get very far," said Mr Jean-Jacques Dordain, former director-general of the European Space Agency (ESA), who will serve as an adviser on the issue to Luxembourg. Looking for precious elements on asteroids tens of million of kilometres from Earth makes more economic sense than may be apparent at first glance. As our planet cooled during the early phase of its formation, most heavy substances - including metals - sank towards its core, making them inaccessible. What did remain close to the surface has already been heavily mined, including an increasingly wide range of rare metals used in the electronics and defence industries. A large number of asteroids are clustered in a belt between Mars and Jupiter, and orbit the Sun in the same way as planets. They are in fact thought to be the remnants of a planet that fractured, perhaps due to a collision. As a result, the same minerals pulled by gravity towards the centre of Earth are more plentiful and accessible on these free-floating fragments. The US National Aeronautics and Space Administration has identified some 1,500 asteroids it has described as easily accessible. Rapid advances in technology have brought a space-based, industrial-scale operation into the realm of feasibility, experts say. Deep Space Industries envisions a four-step process: prospecting, harvesting, processing and manufacturing. Tiny space probes would search for iron ore, rare- earth metals and silicates. Some would be brought back to Earth, and others used as raw material for space production using 3D printers. The probes would also look for water - normally abundant on asteroids - to be broken down into oxygen and hydrogen, and used to fuel satellites and rockets. Last month, the ESA elaborated on a vision for a multinational "research village" on the Moon, a project that it said could replace the International Space Station. The village could be used as a base for mining, and as a stopover for probes heading deeper into space. The Outer Space Treaty of 1967, signed by major industrial powers, stipulates that natural resources beyond Earth are part of the "common heritage" of mankind, raising questions as to whether efforts to privatise space mining would violate its terms.